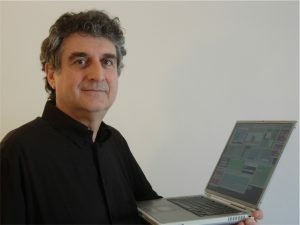 Sound director, computer music researcher, and live electronics interpreter, Alvise Vidolin has given his services to several important Italian and foreign institutions and has worked for several composers such as Claudio Ambrosini, Giorgio Battistelli, Luciano Berio, Aldo Clementi, Franco Donatoni, Adriano Guarnieri, Luigi Nono, and Salvatore Sciarrino, on the electronic realisation and performance of their works. He is co-founder and staff member of Centro di Sonologia Computazionale (CSC -University of Padova) where he is conducting his researching activity in the field of computer assisted composition and performance. Co-founder of the Associazione di Informatica Musicale Italiana (AIMI) he was president of the same between 1988 and 1990. Since 1977 he has collaborated on various occasions with the La Biennale di Venezia with special responsibility for the Laboratorio permanente per l'Informatica Musicale della Biennale (LIMB). From 1992 to 1998 he collaborated with the Centro Tempo Reale of Firenze with responsibility for the musical production. He held the Chair of Electronic Music at "B. Marcello" Conservatory of Music in Venezia from 1975 until 2009. He is a member of the scientific committee of Fondazione Archivio Luigi Nono and a member of the Istituto Veneto di Scienze Lettere e Arti. He has published various scientific works and held conferences in the field of sound and music computing and he is working on the scientific potentials in composition and execution of music offered by informatic means and multimodal systems.